Eggless Banana Oats muffin are delicious and yet healthy combination of bananas and oats. These muffin are so soft and melt in mouth that you won't be able to stop at just one. The goodness of these muffins does not end at bananas and oats as it also contains whole wheat flour (or aata). I was looking for a nice yummy recipe of eggless banana oats muffins from a long time. I tried some recipes available on Internet/shared by friends, did slight variations and after a few trials I got this perfect spot on recipe. This recipe does not contain maida and butter. Just two tablespoons of cooking oil for the entire batch of six muffins!! Use any oil like sunflower oil or olive oil which is odourless and you can enjoy muffins without being guilty of stashing loads of calories. It is really a delicious oats recipe which will make one eat oats without even realising it. 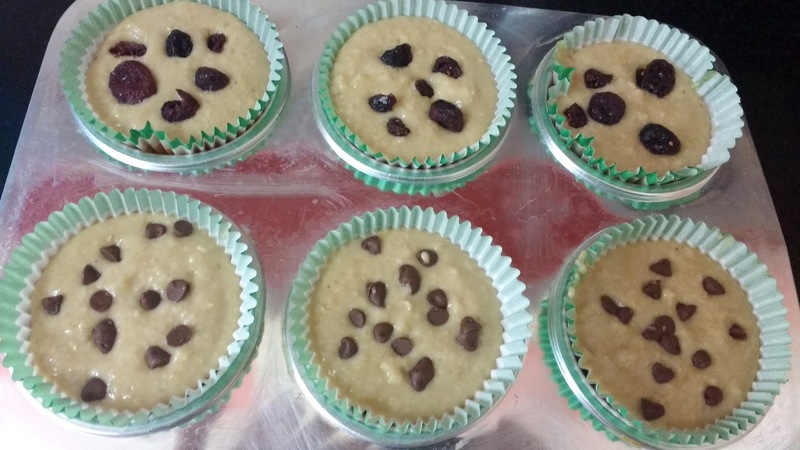 As these muffins are quite fulfilling, they can be given as snacks or in dessert in kids' tiffin. Also, you can grab one of these muffins along with your morning cup of coffee or tea when you are getting late and don't have time for a proper breakfast. These muffins get all their softness and moisture from banana and curd. 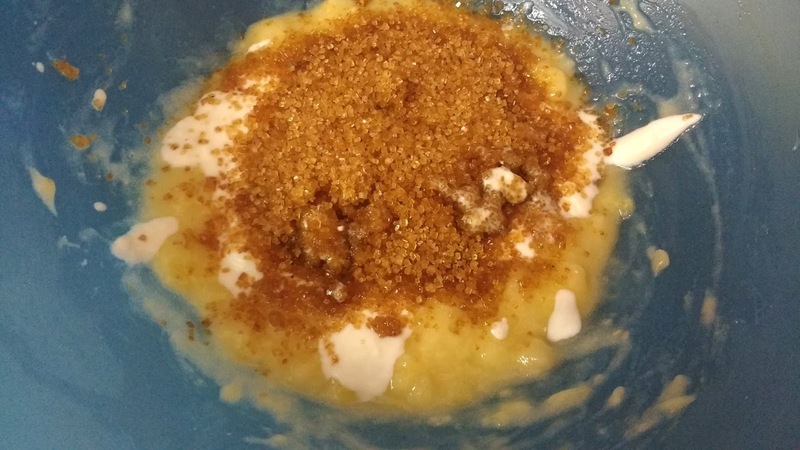 For the sweetness, I have used some brown sugar which is again a healthier alternative to refined sugar we generally consume at home. The muffin get its natural sweetness from the ripe bananas. I would advice, if you are trying this recipe, then please use only ripe bananas as I have added a nominal amount of sugar and these muffins get most of their sweetness from bananas. You can garnish these muffins with any fruit or nuts of your choice. Some of the suggested options which you can use are strawberries, blueberries, dried cranberries, almonds, raisins or chocolate chips etc. I have used here dried cranberries and chocolate chips. Look at the beautiful top and the soft fluffy insides of these muffins. Trust me, they are more delicious than they look. 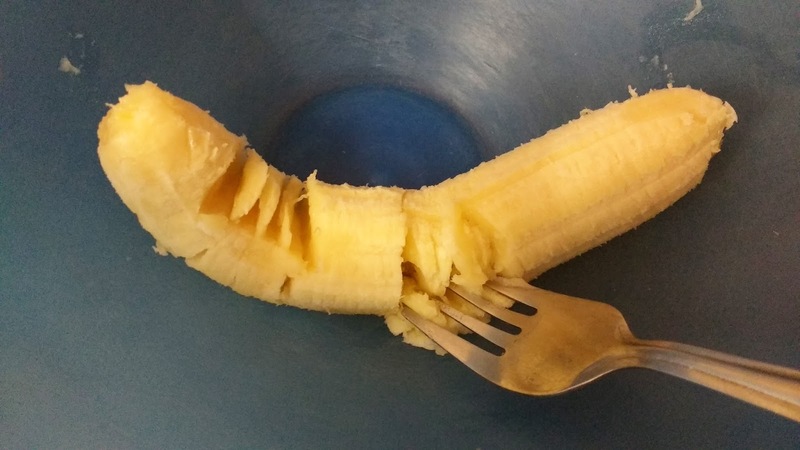 It is a must try banana recipe and I am sure you would love it!! Take oats in a grinding jar and grind them coarsely. Don't grind it too fine. I have used Quaker Oats for this. This is the 1 Kg pack . Smaller packs are also available. It can be easily found in any local departmental store or online also. You can check out this product and its price by clicking here. 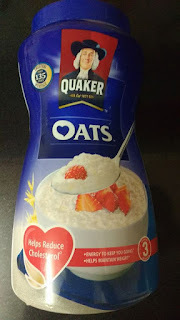 Quaker Oats used in the recipe. 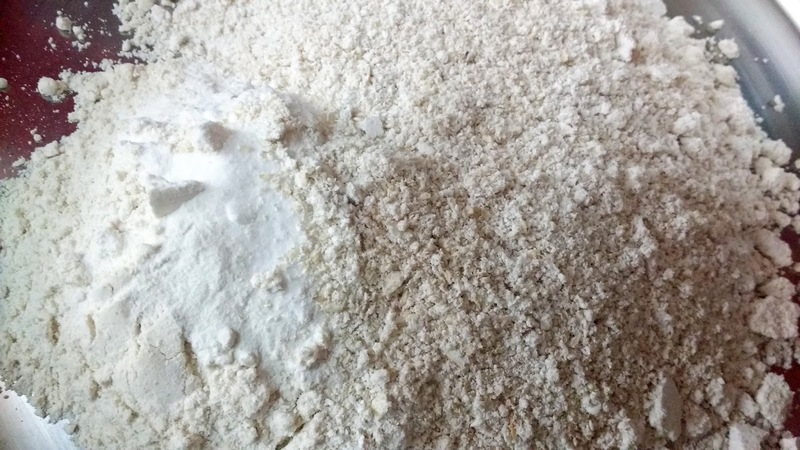 Sieve together whole wheat flour, baking soda, baking powder and salt in a bowl. Add coarsely ground oats to it. Keep it aside. These are the dry ingredients. Peel the banana and mash it with the help of a fork. Add curd and brown sugar (buy here) to it. Mix well till sugar is completely dissolved. Preheat the oven to 180 degrees Celsius. Preheating oven is an essential step in baking. Please do not miss it. While the oven is heating, add milk, vanilla essence and oil to the above mixture. Mix well. Gently fold the dry ingredients in this liquid mixture. Be gentle. Place the liners inside the muffin tray (buy here). If you don't have liners you can also apply some oil or butter in the hollows of muffin tray. Pour the batter in muffin liners using spoon such that there are filled 3/4th . Garnish the muffins with chocolate chips and dried cranberries. If the oven has preheated by now, place the cupcake tin inside the oven and bake muffins at 180 degrees Celsius for 15 minutes. After 15 minutes, do the tooth pick test. 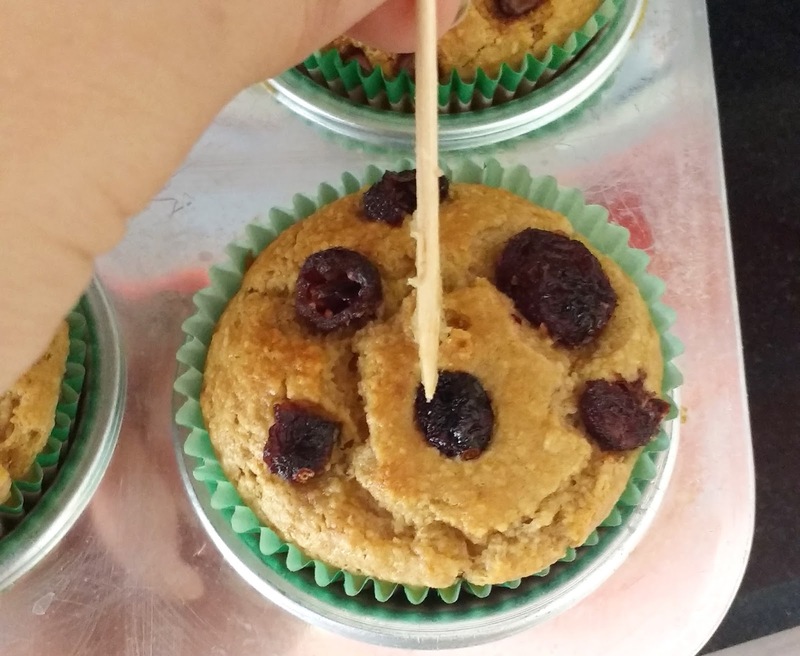 Prick the centre of any muffin by a toothpick and check. If the toothpick comes out clean the muffins are ready. If there is some liquid at the tip, bake for another 2 minutes. Could U pls help me with d cup measurement ? 1 cup = how many ml ? Hi vinny, ya sure. 1 cup=240 ml. Was searching for a similar recipe since ages. Thanks a tonne. I am definitely baking it tomorrow. Only i will make a sugar free version and add fruits for sweetness. Will get back to u for sure! Is it 180 degrees in Celsius? As I have myself never done baking using eggs, I have no idea about this question. What kind of oats is this...is this rolled oats? Do we need to dry roast them a bit before grinding? 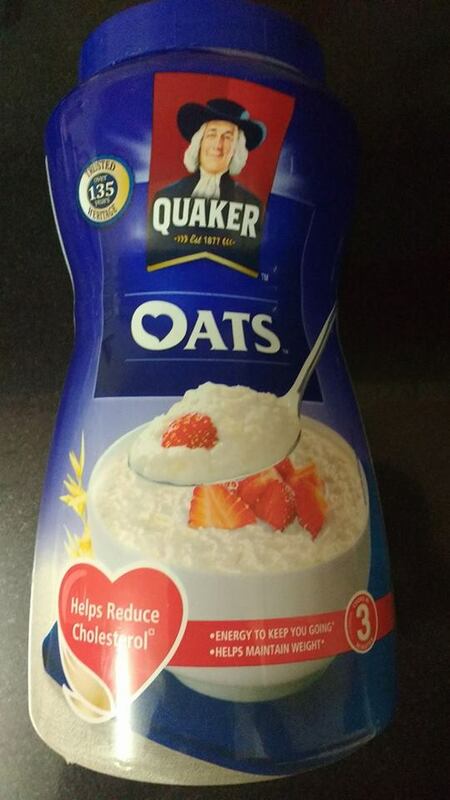 Hi Kirti, I have used Quaker Instant Oats in the recipe. They do not need to be roasted. I have also included a picture of it in the post. Hope it will help you. Hi, can I use white sugar instead of brown? Hi Sweta, Yes you can use white sugar also. This is Priya here from Mumbai, India. What a lovely recipe, that too along with step by step photos!! Very easy to follow instructions. I did a little bit of modification to the ingredients and I'm happy to say that even with the changes, it came out well. And...it was baked it in the airfryer. It took approximately the same time for baking that you've mentioned. May you come up with many more such recipes. I am glad to know that you tried and liked this recipe. Such wonderful words of appreciation from readers like you give me immense satisfaction and motivation to work harder & better. Thanks for taking out time and sharing your valuable feedback. Would surely be coming up with more interesting recipes. Happy Baking! !